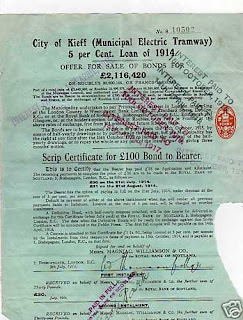 I am *very* glad that I succeeded in buying two pieces of the City of Kieff (Municipal Electric Tramway) 1914 bond. I bought both the 20 pound and the 100 pound version. I consider this an important addition to my collection of Russian City bonds. I will try to provide a better picture when I've received the bonds.